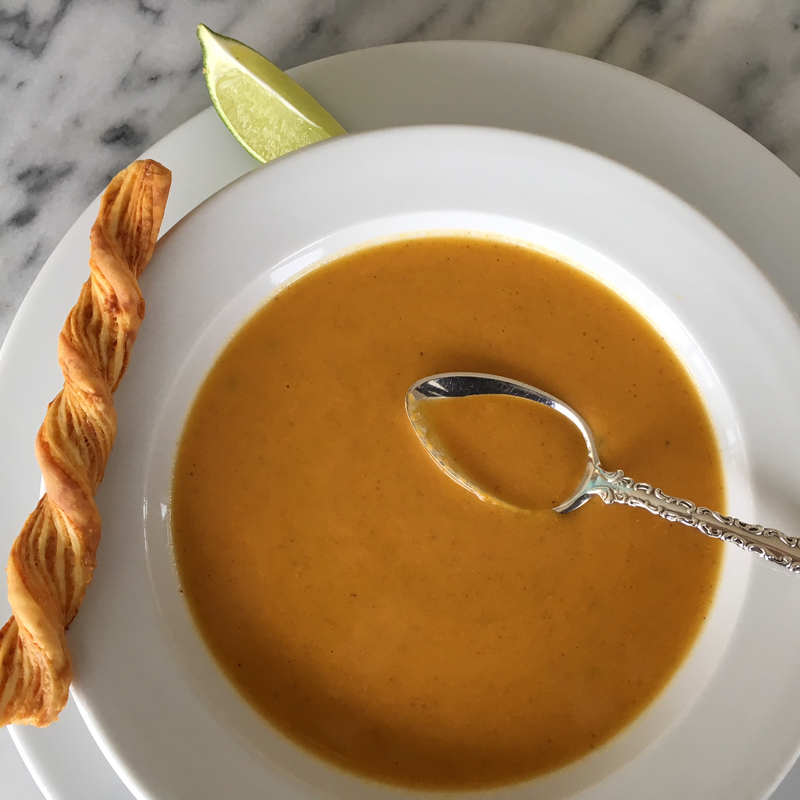 Still in the middle of winter in Vancouver this year, what I feel like most these days is soup and citrus – the warming, comforting richness of a fish soup with the refreshing tang of citrus to finish. Here is a lunch menu (which could easily be used for a dinner) that I made recently. I was aiming for something a bit special yet casual, to welcome visiting family from Boston. We go through heaps of hummus in our household, and I have most often resorted to buying it to keep up with consumption. My working theory is that if something can be easily purchased and the product is as good as home-made, why bother making it at home? Good hummus can be bought at any supermarket and until now I have not been satisfied with the homemade version. My hummus has not been as creamy as I like it and it has had an underlying bitter taste. But I recently learned two techniques that have me preferring my own version. First, using canned chickpeas, drain and rinse as usual, then slip off and discard the skins. OK, if this seems too tedious, you can skip this step. But the second change is a huge improvement which I encourage you to try: make your own tahini. It’s surprisingly easy to do if you have a food processor. 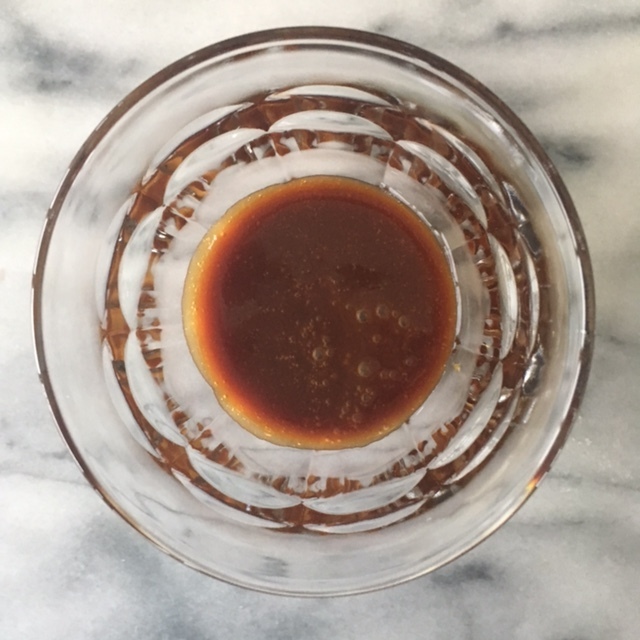 The end result is a richer and more flavourful tahini that is not bitter. There are of course many options for serving hummus: with pita, crackers, vegetables for dipping, etc. 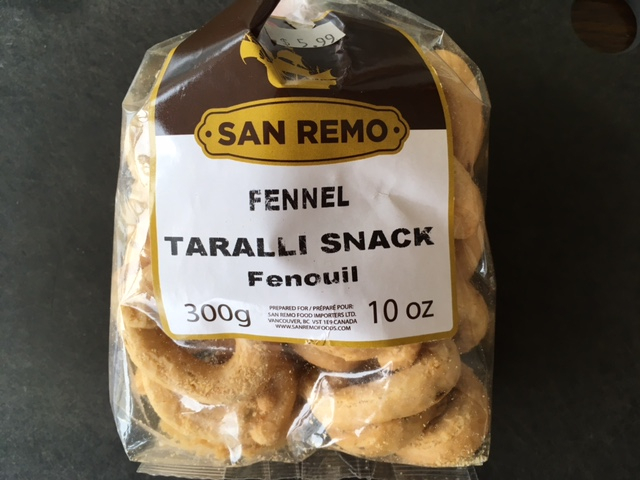 But I happened to find some Italian taralli snacks at Zara’s Deli (photo below) at Granville Island Market. While the hole in the middle makes dipping a bit tricky, the flavour combination and the texture of the crackers is terrific with hummus. If you have time, remove the skins from the drained and rinsed chickpeas. This is not absolutely necessary, but will result in a smoother texture. Place chickpeas in the bowl of the food processor and add the garlic, lemon juice, tahini, cumin and cayenne. Process, scraping the bowl periodically, until the mixture is very smooth. Pour in cold water slowly through the feed tube, until the hummus reaches the consistency that you like, and continue to process for about 1 minute. Add salt and pepper to taste. Garnish as desired, cover and refrigerate. 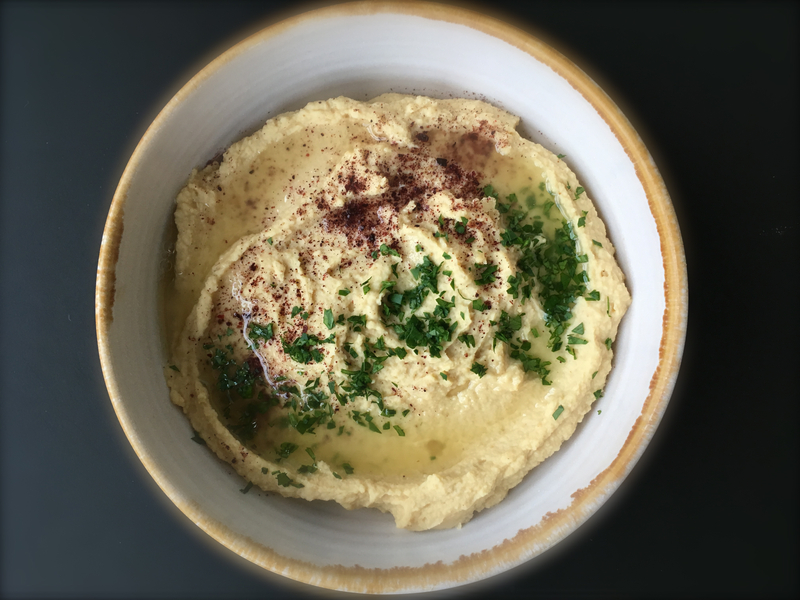 Hummus is best served at room temperature so make sure to remove it from the refrigerator at least 1 hour before serving. Heat a heavy saucepan over medium high heat and add the sesame seeds. Shake or stir frequently until they are evenly toasted. They should be a golden brown. Watch closely as they burn easily. Remove from the heat and cool slightly. Place seeds in a processor and process for about 1 minute. Scrape down the sides of the bowl and add 2 tablespoons olive oil through the feed tube. Process into a smooth paste, scraping down the sides. Add more oil if needed to reach the desired consistency. Pour into a container and add a bit of olive oil, just to cover the surface. Store in the refrigerator. Some of the elements of this dish can be prepared in advance. 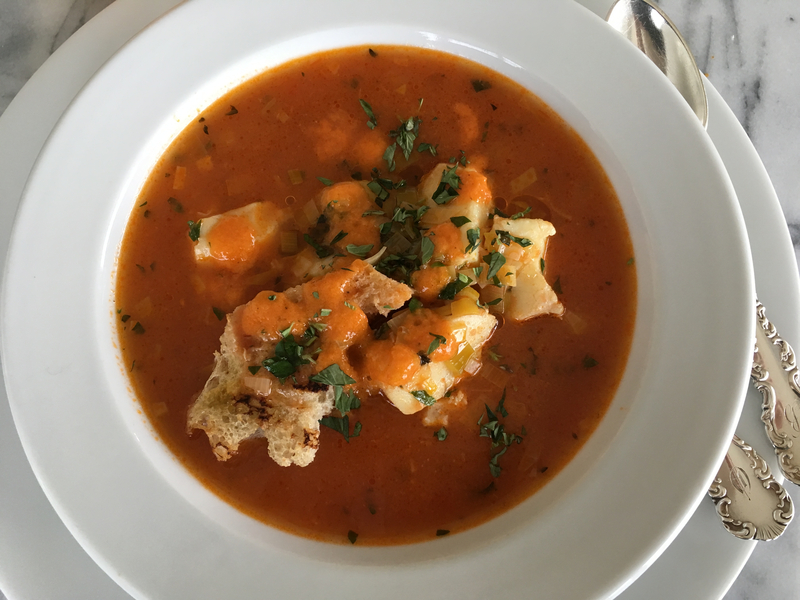 My recommendation would be to make or purchase the fish stock and make the rouille a couple of days in advance. That leaves the final cooking of the fish in the soup and making the croûtes for the same day. This recipe is adapted from Epicurious. Heat 3 tablespoons of oil in a large heavy pot over moderate heat, then add leek greens, onion, celery and carrots and cook until the vegetables begin to soften. Add the garlic and cook, for another 3 minutes. Add saffron, bay leaves and red pepper flakes and cook, stirring, 2 minutes. Add tomatoes and purée and cook, stirring, another 3-4 minutes. Add the wine and simmer, uncovered, until the liquid is reduced by about half. Stir in stock and bring to a boil. Reduce heat and simmer, uncovered, for about 30 minutes. Strain into a bowl and discard solids. Store for up to 2 days, covered in the refrigerator. Cook the fish bones and trimmings, onion, fennel, parsley, lemon juice and salt in a large heavy pot over medium heat. Add the water and wine and bring to a boil, skimming the froth that rises to the surface. Simmer, uncovered, for 20 minutes and then strain, discarding the solids and reserve the stock. This can be done up to 2 days in advance. Makes 1½ quarts. Lay the red peppers on their sides directly on gas burners and turn the flame on high. Or, put them on the rack of a broiler pan about 2” from the heat. Roast, turning with tongs, until the skins are blackened. Transfer to a bowl, cover and let steam for about 20 minutes. Remove the skin and seeds from the peppers and tear flesh into large pieces. Place them in the bowl of a food processor, and add the minced garlic, salt, chopped jalepeno and bread crumbs. Purée, then with the motor running slowly add the oil, lemon juice and pepper, blending until very smooth. Remove and store in an air tight container in the refrigerator for up to 3 days. Remove crust from the loaf and tear inside into roughly 3” pieces. Brush with the remaining 2 tablespoons olive oil and grill on all sides, or bake at 350ºF until lightly toasted. You want the outside toasted and the inside soft. Set aside until ready to serve the soup. Heat 2 tablespoons of butter in a 4 quart heavy pot over moderate heat. Cook the white part of the leek until it begins to soften. Add the soup base and bring it to just boiling. Season to taste with salt. Add cubed white fish and simmer until fish is just opaque, about 2 minutes. Stir in ½ cup of the rouille. 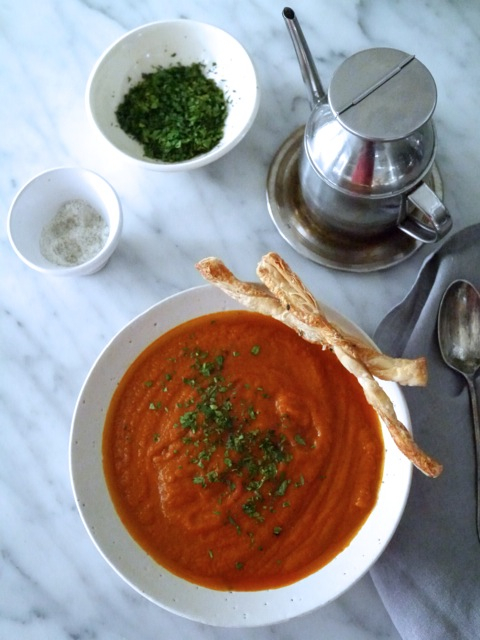 Put bread croûtes in warm soup plates and ladle soup over top. Garnish with oregano and parsley and serve remaining rouille on the side. I was in the mood for crêpes and since citrus fruit is so good right now, I searched online for an interesting combination. I found what I was looking for at What Katie Ate: Food and Photography. I used my own crêpe recipe and tweaked the compote. The original recipe suggests cooking the citrus for part of the time with the juices and sugar, but I found that the fruit fell apart that way, so my instructions keep the fruit separate. Just make sure you drain it well and collect all of the juices for the syrup. Crème Fraîche can be made ahead (or you can purchase it) by combining 1 cup whipping cream and 2 tablespoons buttermilk in a jar. Shake well and leave at room temperature, covered, until it thickens, about 24 hours depending on how warm your kitchen is. Refrigerate until ready to use. Prepare the citrus compote: Cut the top and bottom from the fruit, then place on a chopping board and using a sharp knife, cut away all of the peel and pith. Take the fruit in your hand and over a bowl, cut each inner segment away from the membrane, letting them fall into the bowl. Squeeze out the remaining juice from the membrane into the same bowl. 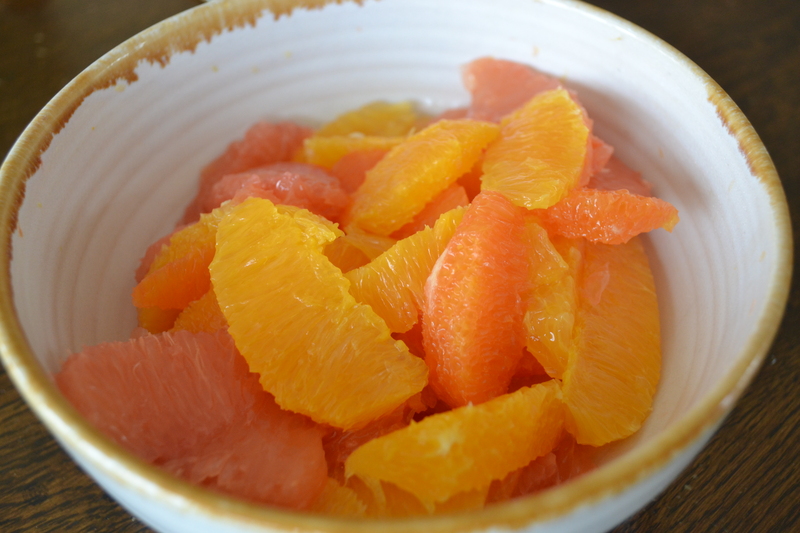 Strain the juices into a large frying pan, reserving the citrus segments. 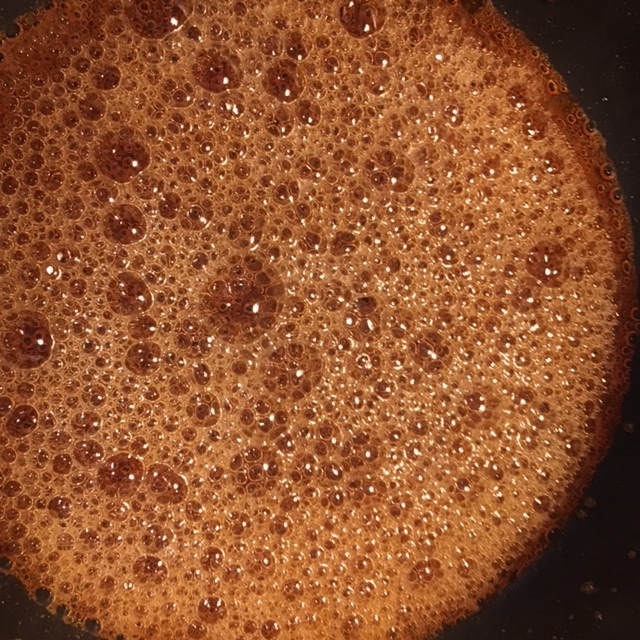 Heat the juices with 2 tablespoons of sugar and simmer until the mixture reduces by ⅔ and is syrupy. Stir in the orange segments and the mint leaves and set aside. Can be made a few ours in advance and kept at room temperature. For the rosemary honey: Place honey and rosemary in a small saucepan, bring to a simmer and cook over medium, heat without boiling for about 5 minutes to infuse the flavour. Transfer to a jar and reserve. Warm a bit before serving. For the crêpes: In a bowl, combine flour, sugar and salt. Add eggs, ½ cup of milk, vanilla, and whisk until smooth. Gradually add remaining milk, stirring constantly. Whisk in melted butter. Preheat a 6” crêpe pan over medium heat. When the pan is hot, brush with butter. For each crepe, pour about 2 tablespoons of batter in the centre of the skillet. Tilt pan to spread batter evenly until it covers the entire bottom of the pan. When the edge peels off easily and begins to brown, turn the crêpe with a spatula. Continue cooking for about 10 seconds and then remove from pan. Place cooked crêpes on a plate as you go. Cover with aluminum foil to keep them from drying. Crêpes can be made 1 day in advance, well-wrapped and covered, in the refrigerator. Warm in a 350ºF oven for about 20 minutes before assembling. To Serve: Place a warm crêpe on a plate, place some citrus compote on one quarter and top it with a spoonful of crème fraîche. Fold the crêpe over the filling and then into quarters. Depending on appetites, you can offer 1-2 per person. Finish the presentation with a drizzle of rosemary honey and mint leaves. Since January is a time when Julie and I feel like eating a bit more healthily, we devised this menu with that in mind, but also with some suggestions for possible add-ons. The soup is based on a recipe that we enjoyed at our friend Laura’s house and she generously shared it. I love the combination of ingredients which produce a rich tasting and deep, nourishing flavour. For the main course, we have a refreshing citrus-y salad, featuring blood oranges which are available in markets now. I like the addition of seared tuna, which connects to the Asian theme of the soup, but the salad can be prepared with or without the tuna, served as a side to chicken, or as an appetizer with the addition of crumbled feta, as photographed here. 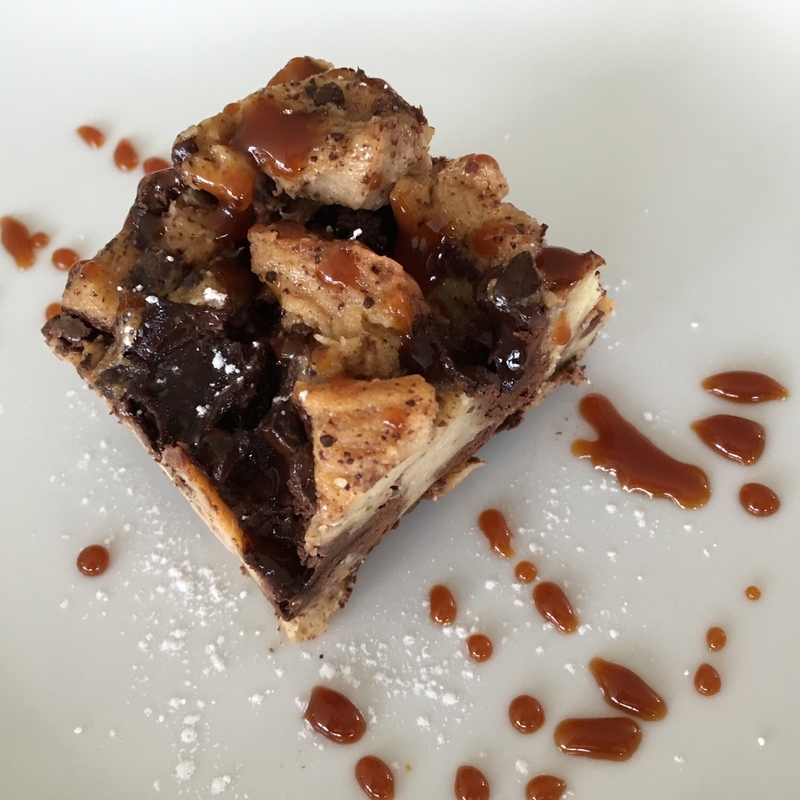 The dessert pulls out all the stops – with such a healthy start to the meal, why not splurge on a comforting bread pudding? The recipe for the pudding is very simple and quick to put together and smells amazing when it’s in the oven. Make it late in the day and greet your guests with the aroma! The only adjustments I made to the original recipe were to use yams instead of sweet potatoes and 1 tablespoon, not 2, of red curry paste. I have included a recipe for vegetable broth but you can of course use store-bought. 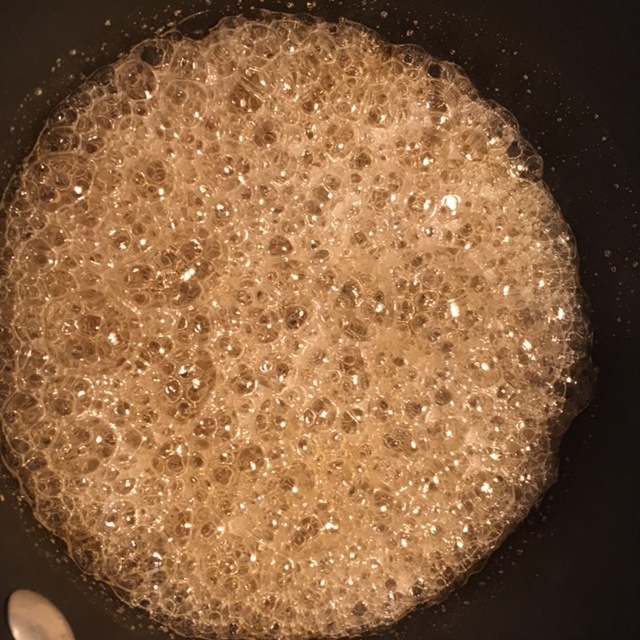 Melt coconut oil in a large pot over medium heat. Add onion, garlic and ginger and sauté until the onion is translucent. Stir in the curry paste and cook and stir for one more minute. In a small bowl, whisk together ½ cup of the broth with the almond butter until smooth. Add to the pot along with the remaining broth, carrots, yams and seasoning. Bring soup to a boil, then reduce to a simmer. Cover and cook for 15-20 minutes or until the vegetables are soft. Cool the mixture slightly, then purée in batches in a blender. Return the soup to the pot, adding more vegetable broth if necessary and check the seasoning, adding more salt or pepper to taste. Ladle hot soup into bowls and garnish as desired. Heat the olive oil in a large pot over medium heat. Add the garlic, ginger, onions, celery, and carrots. Cook until softened, about 5 minutes, stirring often. Add the water, bay leaves, parsley and thyme. Reduce heat to low and simmer, partially covered, for 45 minutes. Pour the broth through a fine mesh strainer into a large heat-proof bowl or pot and discard solids. Once the broth has cooled, transfer to airtight plastic containers and refrigerate it or put into freezer bags and store in the freezer. Makes about 6 cups. Season tuna with salt and pepper. Heat oil in a pan and sear tuna over medium high heat about 1½ minutes per side. Remove from heat and slice. Mix juices, vinegar, shallot and zest in a small bowl. Slowly whisk in olive oil and season to taste. Whisk milk, eggs and bourbon together in a large bowl. Add the chocolate, bread cubes and sugar. Toss to coat and set aside to soak for about 45 minutes. Stir once or twice while soaking. After soaking for about 40 minutes, preheat oven to 350ºF. Simmer sugar and water over medium heat, swirling the pan but not stirring for about 15 minutes or until the mixture is a rich amber colour. Watch closely as the caramelization happens quickly at the end. The photos below show the mixture just before it starts to caramelize, what it looks like when it is ready to come off the heat, and the finished product. Remove pan from heat and very slowly add the cream, stirring. Add the bourbon and a pinch of salt and place back on the still warm burner for another minute and stir. Transfer sauce to a heat-proof dish or bottle and let cool. Store covered in the refrigerator and bring to room temperature before serving. You can also microwave it for about 30 seconds to warm it. Our December menu may come just in time for a celebratory New Year’s dinner. Or, one or two of the recipes may be just right for a more casual meal. This recipe is on Julie’s website where she has many more appetizing ideas. Just like making pancakes the first blini is a bit of a throwaway, so use it as your learning curve to determine the correct heat level for your pan. No butter is needed to cook the blinis as long as you use a good quality non-stick pan. You can, of course, use sour cream in place of the crème fraîche, and top with smoked salmon or other fish. At this stage the batter should resemble a somewhat thick pancake batter. If is is really thick then add in 1 to 2 tablespoons of milk to achieve the right consistency. Preheat a nonstick pan over medium heat and allow it to heat up thoroughly. Spoon about 1 1/2 teaspoons of the batter into the hot pan and allow to cook for approximately 2 minutes and the bottom is golden brown. Flip the blini and allow to cook on the other side for an additional minute. Remove to a small sheet pan and keep warm is a 200 degree oven while you cook the remaining blinis. Place the blinis on a serving platter and place a dollop (or a small quenelle if you are feeling super fancy) of crème fraîche in the centre of the blini. 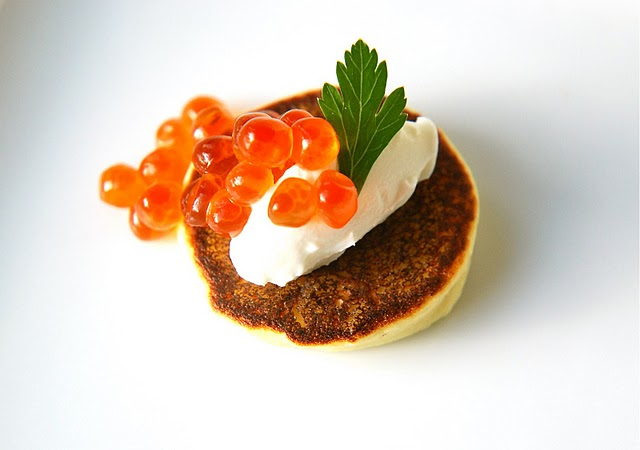 Place another small dollop of the salmon roe on top and garnish with a sprig of parsley. Roasting the vegetables for this soup gives it a deep and rich flavour that improves with time, making it an ideal make-ahead recipe. It can be made 2-3 days in advance. It is healthy but filling, so I recommend serving it in small bowls if you are following this entire menu. Preheat oven to 350°. Put tomatoes, garlic, onion and fennel on a large baking sheet. Drizzle with olive oil and season with salt and pepper. Roast about 1 hour, or until vegetable are soft and slightly caramelized, then cool slightly. Peel the garlic cloves and the onion. Sauté the shallot, sugar and fennel seeds in butter until the shallot is softened but not browned. Add the tin of diced tomatoes, the roasted vegetables and stock and simmer, covered for 20 minutes. Purée mixture in blender. If soup needs more liquid, add more stock or water. Season to taste with salt and pepper and and garnish with cheese straws, if desired. This is a decadent dish, perfect for a special meal. It can be assembled in stages and ready for final baking well in advance. Julie kindly offered her recipe and to demonstrate how it’s done, which I captured on my iPhone. For the filling: Trim the mushroom stems close to the caps. Put the mushrooms, shallots and garlic in a food processor and pulse until finely chopped but not puréed, scraping the bowl as needed. Or, you can chop all of these ingredients by hand if you don’t have a processor. Transfer the chopped mushrooms to the centre of a clean dish towel. Gather up the sides of the towel and twist, keeping the mushrooms well contained in the cloth, bonbon style. With one hand, hold the ball of mushrooms over the sink, and with the other hand, twist the gathered cloth, squeezing out as much liquid as possible. Heat the butter and oil in a 10” skillet over medium heat. Add the mushrooms, cover, and cook stirring occasionally until the mushrooms are soft and fragrant, 3-5 minutes. Add the parsley and season with salt and pepper to taste. This mixture can be made up to 2 days ahead, covered and refrigerated. For the croustades: Season the tenderloins generously on all sides with salt. Heat the butter and oil in a sauté pan over medium-high heat until very hot. Put three tenderloins in the pan and sear on one side until browned, 1-2 minutes. Turn and brown the other side. Transfer to a plate lined with paper towels. Repeat with the remaining filets. Cover and refrigerate for at least one hour. 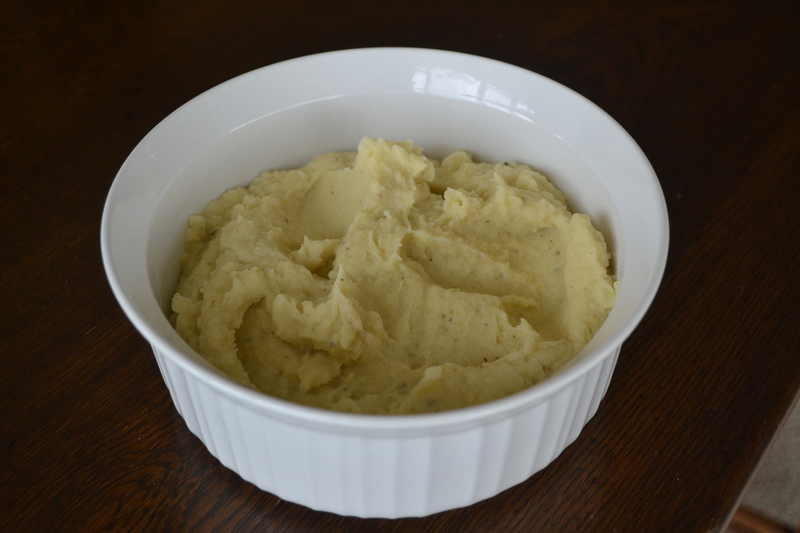 To assemble: Mash the Boursin with a fork in a small bowl until spreadable. Remove phyllo from package and lay the stack on the counter. Take one sheet of phyllo from the stack and cut into 4 squares. Cover the remaining phyllo with a damp dish towel while you assemble each croustade. Brush squares with melted butter and sprinkle with ½ teaspoon of chives. Make four layers, omitting chives from last layer, with the corners of the phyllo pointing in a different direction, star-like. Blot one tenderloin dry with a paper towel, set it in the centre of the star, and sprinkle it with salt. 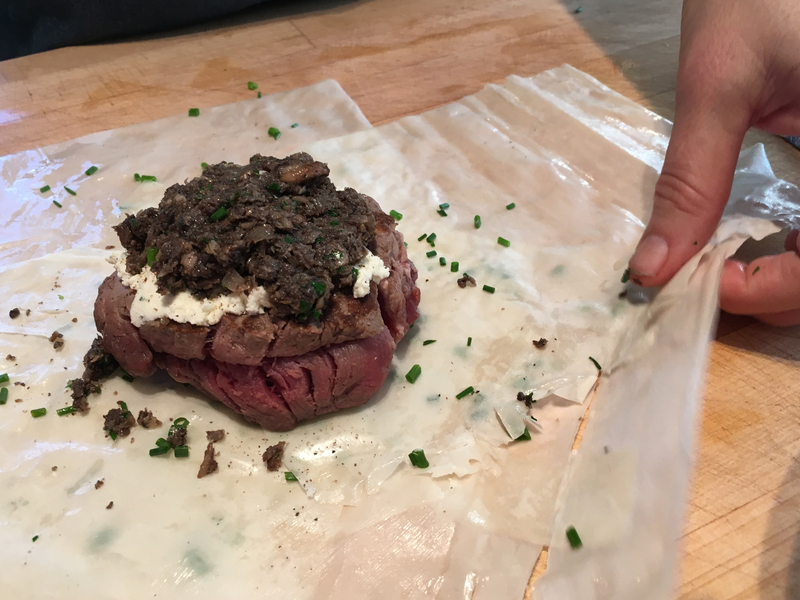 Spread about 1 tablespoon of the Boursin on the filet and top that with 2 tablespoons of the mushroom filling. 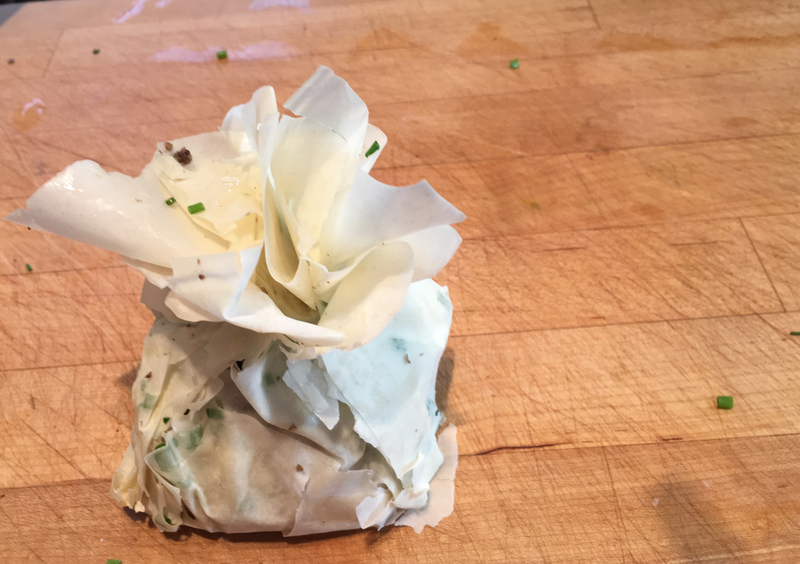 Pick a starting point and work your way around the filet, gathering the edges of the phyllo star together. Lightly pinch together the gathered phyllo close to the surface of the meat to hold it in place. Pull the corners open slightly as if making a paper flower. Brush the whole exposed surface lightly with more butter being sure that the bottom is buttered as well. Transfer to a heavy baking sheet. Repeat this process for the remaining tenderloins. If you are working ahead, chill the tenderloin packages uncovered on the baking sheet until ready to bake, up to 2 days. 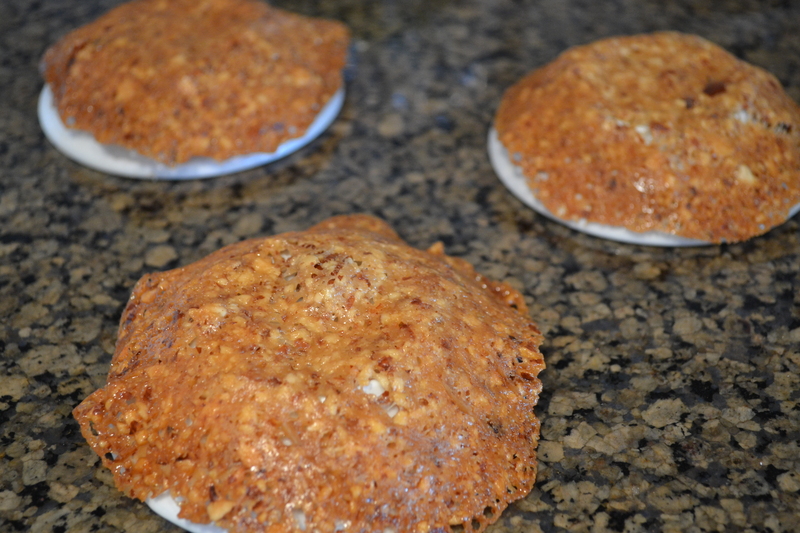 To bake: Take the croustades out of the refrigerator about 20 minutes before you are ready to bake them. Position the oven rack in the lower third of the oven and heat the oven to 400ºF. Bake the croustades for 17-22 minutes depending on how well done you prefer tenderloin, rotating the baking sheet after 10 minutes to ensure even browning. Serve immediately. Julie served hers on top of roasted carrots and garnished it with quickly sautéed brussel sprout leaves. This tart can be made 1-2 days ahead and can serve at least 12 people as it is rich and chocolatey. The recipe is slightly adapted from Gjelina, Cooking from Venice, California. For the crust: In a medium bowl, combine the flour, cocoa, ground almonds, nuts and salt. Set aside. In a mixmaster fitted with the paddle attachment, beat the butter and sugar on medium speed until fluffy, about 2 minutes. Turn the mixer speed to low and add the flour mixture, and mix until just combined. Transfer the dough to a sheet of parchment paper. Place another sheet of parchment on top and roll out the dough to a ⅛” thick round, 12-13” in diametre. Refrigerate for at least 2 hours, or overnight. Preheat the oven to 350ºF. Butter a 10” tart pan with a removable bottom. Press the dough into the bottom and sides of the pan. The dough will probably crack, but just press it back together. Bake for 10-15 minutes until firm to the touch. Don’t worry if the crust shrinks down the sides a bit as it bakes. Transfer the pan to a wire rack to let cool. Lower the oven temperature to 325ºF. For the filling: Set a large heatproof bowl over 1” water in a large saucepan over medium heat. Add the butter and chocolate to the bowl and melt, stirring occasionally, until smooth. Whisk in the cocoa powder, and then add the brown sugar and salt. Continue whisking until the sugar is dissolved and the mixture is shiny. Add the eggs, one at a time, incorporating each one before adding the next. To bake: Pour the filling into the tart and bake until it puffs up slightly and the surface is shiny, like a brownie. The centre should be just set and does not jiggle when you shake the pan, about 35 minutes. Remove from the oven and let cool in the pan on a wire rack for 40 minutes. Gently remove the sides of the pan. 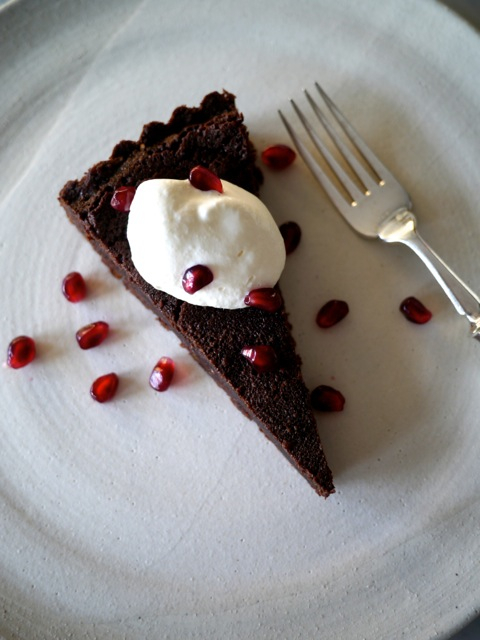 Slice and serve with some whipped cream and a sprinkle of pomegranate seeds. After being away from this site for way too long, I am finally back to writing with a new plan for 2016. Actually it’s a project with a process that I intend to develop and explore together with my friend, the incredibly talented cook and entrepreneur Julie Marr. 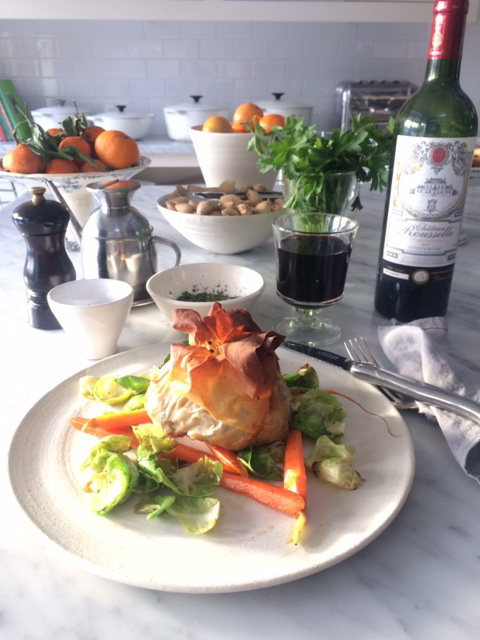 Sharing recipes and ideas is a huge part of my cooking life and I have found that it is in the conversations about food that the inspiration to cook and new ideas to test come about. Julie and I delight in these conversations and share similar approaches to cooking. We will be collaborating on this monthly menu project from its design and testing, to writing about our experiences on our blogs. One of the things I love to do is to entertain at home. Planning the menu, shopping, staging the preparation and envisioning the presentation are all elements I enjoy. I hear from many friends and readers that while they too like to cook and to entertain, they seldom do so because they simply cannot find the time in their busy lives or feel that they do not have the expertise to pull it off. As our project evolves, Julie and I will to try to demystify the hosting experience by providing step-by-step guides to hosting dinner parties for every month of the year, using ingredients that are at their best in Vancouver markets each month. Included here will be what might be considered when designing the menu, shopping lists, how to prepare elements in advance and photographs which illustrate the process and final presentation. Please stay tuned as each month rolls out and we add these elements to the menus. A few weeks ago Julie and I met to plan this month’s menu. Ingredients were chosen according to what is available and at its best in Vancouver markets in February, and the kinds of food that people generally feel like eating in a winter month on the west coast. Another consideration when planning a dinner party menu is how much of it can be prepared in advance so that hosts can relax and enjoy themselves. The recipes will include instructions for this. In what can be a rainy and dark month here in Vancouver in February, it helps to inject vibrant colours and flavours into our cooking. 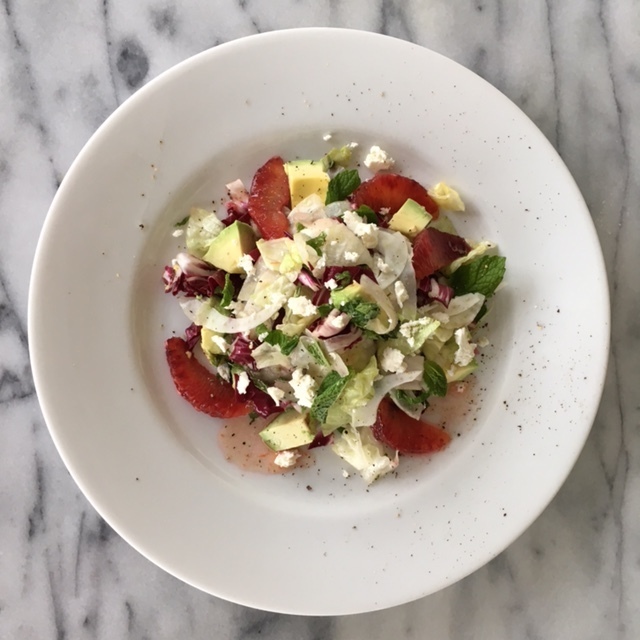 Tastebuds are enlivened by the taste of citrus and because these fruits are at their best this month, they make their way into the salad, the vegetable and the dessert in the following menu. When planning the main course for this menu, we discussed leaving out a carb as the duck and fennel stand alone very well. However, when we tried out the menu we ended up making our own additions. I made popovers seasoned with black pepper and roasted ground fennel seeds and Julie made the classic French dish, potatoes cooked in duck fat. A note about appetizers: My preferred approach to appetizers is to consider ingredients that are already in the refrigerator, or ones that I know we will enjoy as leftovers, and arrange them on one large platter for guests to help themselves. This is such an easy way to cover this part of the menu as it does not require much preparation – just assembling a few ingredients. It also accommodates all types of eaters, ones who eat lightly and those with larger appetites. Photographs: I am grateful that Julie is a much more able photographer than I am and I have included some of her photographs here with acknowledgement. Trim the beets of their roots and stems and wash them well. Toss the beets with 1 tablespoon of olive oil, sprinkle with some salt and then wrap them in aluminum foil and place on a baking sheet. Place in the oven and roast for 40 to 50 minutes until they are easily pierced with a sharp knife. When the beets are done remove from the oven and allow to cool. When cool enough to handle peel the beets by slipping off the skins with your fingers and then slice in 1/2 inch wedges. Place them in a medium bowl and toss with 1 tablespoon of the olive oil, a generous squeeze of lemon juice and some salt and pepper. Taste and adjust seasoning. Set aside. While the beets are roasting, combine the shallots, jalapeños, lime juice and 1/2 teaspoon salt in a small bowl and let sit for 5 minutes. Whisk in 1/2 a cup plus 2 tablespoons of olive oil and then taste for balance and seasoning. Cut the avocados in half lengthwise, remove the pit and peel. Cut into 1/4 inch slices and season with salt and freshly ground black pepper. Fan the avocado slices on one side of six individual plates. Place the beets on the other side and arrange the arugula in the middle. Toss the crab gently with two-thirds of the jalapeño lime vinaigrette, the parsley and the cilantro in a medium bowl. Taste the crab and season with some salt and/or lime juice if you like. Pile the crab on the arugula and top with the crème fraîche and a few grinds of black pepper. Drizzle a bit more of the vinaigrette over the avocado. In advance: the beets can be roasted and the vinaigrette can be mixed several days ahead and kept covered and refrigerated until ready to assemble the salad. As noted, the crab is optional as the salad works well without it too. Recipe adapted from Bromberg Bros. Blue Ribbon Cookbook by Bruce Bromberg, Eric Bromberg and Melissa Clark. Melissa Clark wrote about the development of this contemporary version of the classic French duck confit in 2010 in The New York Times. This recipe makes cooking your own confit at home easy and Julie and I have found that it works well when cooked in advance, so instructions are given for this. We have adjusted the roasting times given in the original recipe according to our experience with the average size of duck legs purchased here in Vancouver. Place the duck legs in a shallow dish and season with the salt and pepper. Strip the leaves of thyme from the sprigs and scatter on top of the seasoned legs and add in the torn pieces of bay leaf. Cover tightly with plastic wrap and refrigerate for 24 hours. The next day, heat the oven to 325ºF. Allow duck legs to come to room temperature. Place the duck legs, fat side down, in a large ovenproof frying pan with the legs fitting snugly in a single layer. You may have to use two pans or cook them in batches. Heat the duck legs over medium heat until the fat starts to render. When there is about ¼ inch of rendered fat in the pan, about 20 minutes, flip the duck legs over and cover the pan with foil or a lid. If you have used two pans, transfer duck and fat to a roasting pan. Place in the preheated oven. Roast the legs for about 1½ hours, or until the meat is very tender, falling away from the bone and the duck is golden brown. Remove duck from the pan and keep covered lightly with foil on the counter if serving within the next 2 hours, or cover and refrigerate until ready to finish. Reserve duck fat for reheating the duck later. To Finish: Heat some of the duck fat over medium-high heat in a large frying pan (or two) and reheat the legs, skin side up and covered with the lid or foil, about 5 minutes. Remove the lid, turn the duck over, and sear until the skin is dark brown and crispy. Serve immediately with the roasted fennel. Carefully slice between the flesh and the membrane to cut out orange sections and set aside. In a large frying pan over high heat, warm the olive oil. Add the fennel wedges, cut side down in the pan. Cook until the fennel is caramelized, about 3 minutes. Flip, lower heat to medium-high, and cook on the other side until caramelized, about 3 more minutes. Season with salt, add fennel stems and continue to cook until the stems are well-browned, another 2 minutes. Add the orange juice, wine and stock and reduce the until the sauce is thickened and the fennel is deeply seared and starting to soften, 2 to 3 minutes. Add the pepper flakes and season with salt and pepper. Place on warm dinner plates, garnish with fennel fronds, orange segments and fennel pollen, if using. In Advance: This dish can be made a few hours ahead and served at room temperature. 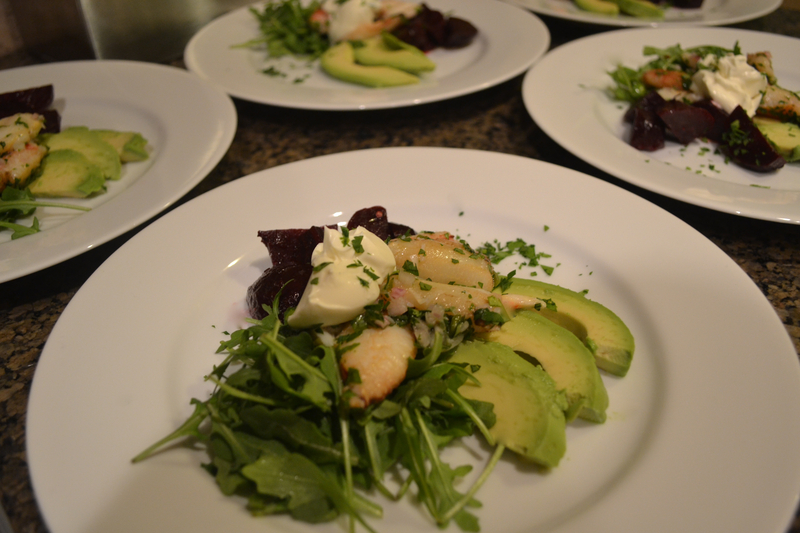 Julie served this menu family-style, a nice way to make the meal less formal and relaxed. Do whatever works best in your life and your kitchen. Peel the pears, cut them in half, and scoop out the core with a melon baller and trim the stem end. Place in a saucepan that is large enough to hold the pears in one layer. Add the rest of the ingredients and just enough water to cover the pears. Set the saucepan over high heat and bring liquid to a boil. Reduce the heat and simmer, stirring occasionally, until the point of a knife easily pierces the pears, about 15 minutes. (This may take longer, depending on how large and how ripe the pears are.) Remove the pan from the heat and allow the pears to cool in the liquid. With a slotted spoon, transfer the pears to a plate and strain the cooking liquid over a bowl. Discard the solids and return the liquid to the saucepan. Place over medium-high heat and cook until the liquid is reduced to a light syrup, about 30 minutes. Let cool and pour over the pears. Store in the refrigerator in a covered container until ready to serve. Can be made 2-3 days before serving. Mix the Mascarpone Cream: this can be done one day ahead. In a small bowl, whisk the cheese with the sugar and lemon zest. Keep refrigerated until ready to serve. Toast the pistachio nuts: To toast this small amount of nuts, it is easiest to do in a small frying pan over medium-high heat on the stove. Watch carefully and shake the pan often to allow the nuts to toast evenly. Remove from the heat, chop and cool completely before storing in a covered jar until ready to use. To Serve: Remove pears from the refrigerator and place one on each of 8 shallow soup plates. Using a piping bag, or small spoon, pipe about 1 T. of mascarpone cream in the cored space of each pear. Spoon some of the reduced poaching liquid around each pear. Garnish with toasted pistachio nuts and mint. Serve with florentines, if desired. Preheat the oven to 300ºF. Line a baking sheet with parchment paper and lightly brush the paper with vegetable oil. In a bowl, mix together the egg white, icing sugar, sliced almonds, salt and orange zest. Fill a small bowl with cold water and place it along with a fork next to your lined tray and the bowl with the almond mixture. Dip your hand in the cold water before lifting a tablespoon-sized portion of the almond mixture and place on prepared baking sheet. Continue placing tablespoon size portions of the almond mixture, evenly spacing them on the sheet.Dip the fork in the cold water and flatten the mounds of almond mixture as much as possible. Try to avoid having gaps between the almonds.Bake in the preheated oven for 10 to 15 minutes until the cookies are evenly golden brown. The time will depend on how large the cookies are.Let the cookies cool and then lift with a spatula and place them on a cooling rack. Continue baking all the cookies in batches. Once the cookies are cool, melt the chocolate in a clean dry bowl either in the microwave or over a pot of simmering water. Spread the underside of the florentines with the chocolate and place upside down on a parchment-lined tray. Let cool until the chocolate firms up. Serve or store in an airtight container at room temperature until ready to eat. Makes 20 – 25 cookies. This menu celebrates the fish, basil, rhubarb and strawberries that are all fresh and abundant in Vancouver markets right now. Many of the elements of this party menu can be made ahead of time and assembled just before serving. Instructions for this are in italics within each recipe. For Sauce: Combine onion, capers, horseradish, mayonnaise, and vinegar in a small bowl. Season to taste with salt and pepper. The sauce can be mixed together up to 3 days before serving. For Crostini: Slice a baguette or ciabatta bread in 1/2″ slices and brush lightly with olive oil. Grill or broil until browned on both sides. Rub one side with a peeled clove of garlic. 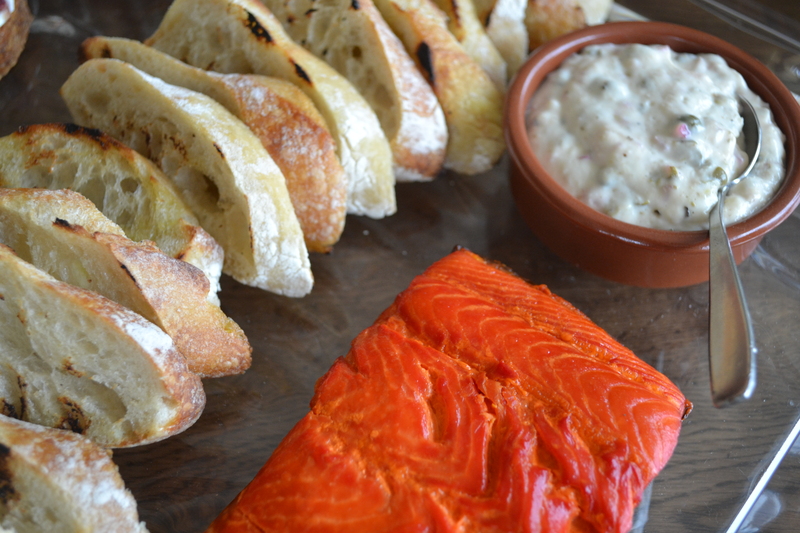 Place the salmon on a platter with the bowl of sauce and crostini or crackers alongside. In a blender, combine 1 C. basil, vinegars, honey, garlic, and mustard and whirl to blend. Pour in oil slowly to emulsify vinaigrette and season to taste with salt and pepper. Can be made several days ahead of time and kept in a covered container in the refrigerator. Toss mushrooms with a little olive oil and salt and pepper. Grill (or sauté) until cooked, and set aside until ready to plate the salad. In a large bowl, combine lettuces and green onion. Add vinaigrette (you may not need it all), toss, and portion onto 6 salad plates. 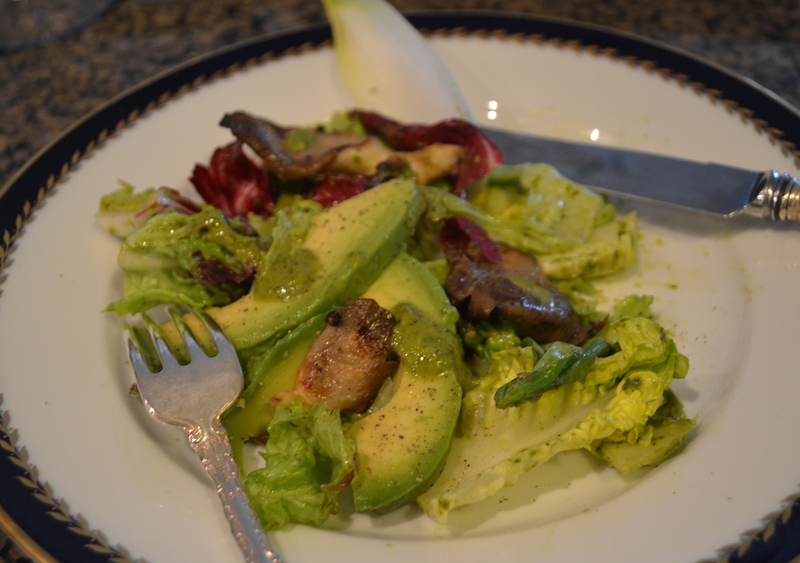 Top with oyster mushrooms and slices of avocado and drizzle with a little more vinaigrette. This recipe is adapted from the A.O.C Cookbook, by Suzanne Goin. I am a huge fan of this talented chef and have referenced her recipes several times on this site. She and her Los Angeles based kitchen staff are masters of unusual combinations of flavours and textures. The recipes generally have several elements but I have suggested ways here to stage the process to make it more possible for the home cook. The original recipe calls for sea bass, but I have made it with halibut or lingcod. 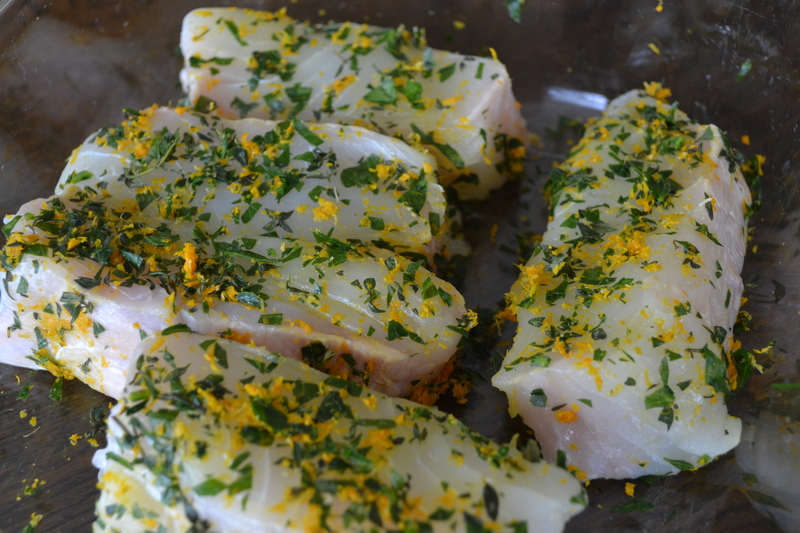 Season fish: finely grate 1 T. zest from grapefruit and oranges, mix with thyme and parsley and rub all over fish. Cover and refrigerate for at least 4 hours. Citrus: Cut top and bottom off fruit and place cut side down on a cutting board. Following the contour of the fruit with a sharp knife, remove the peel and pith. Holding each piece of fruit in one hand, carefully slice between the membranes to release the segments in between. Discard any seeds. Reserve the juice in a measuring cup, adding enough more juice to make 1 1/2 C. juice for the sauce. Can be made early in the day. Cover both fruit segments and juice with plastic wrap until ready to make the sauce. To make citrus sauce: Pour citrus juice, sugar and chile flakes into a saucepan, and bring to a boil over high heat. Reduce juice by 2/3, turn the heat down to low and whisk in the butter, 1/4 t. salt and a pinch of freshly ground black pepper. Swirl the pan to incorporate the butter as it melts, add the fruit segments and remove from the heat. Taste for seasoning. 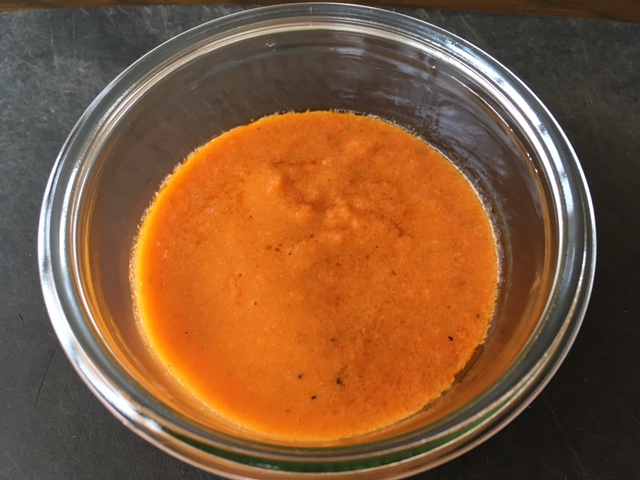 The sauce can be prepared early in the day, up to the point of reducing the juice. When ready to cook the fish, reheat the juice concentrate, whisk in the butter and season. 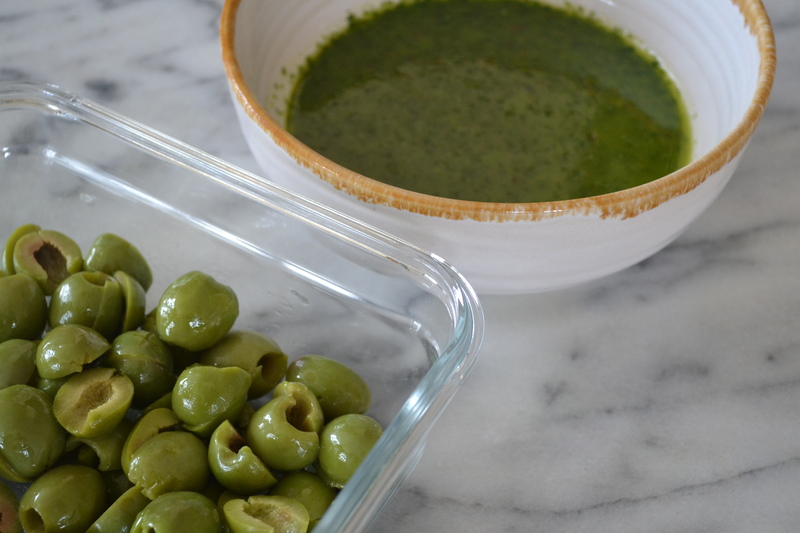 To finish the harissa: Toss the pitted olives in 1/2 C. of the green harissa (recipe below) and season with the juice of 1/2 a lime. Set aside at room temperature until ready to plate the fish. To cook fish: Heat a grill pan to high, brush fish with olive oil and season with salt and pepper. Cook quickly until well-browned with grill marks on one side, then turn and remove fish from pan as soon as it’s just cooked, with the centre still slightly translucent. If you do not have a grill pan, use a heavy frying pan instead. To serve: Heat fennel potato purée and place about 1/2 C. on each plate. Put the grilled fish on top, spoon citrus and sauce over and around, and top with green olive harissa. Harissa can be made several days ahead of time and kept in a covered container in the refrigerator. This sauce makes more than you need for the fish dish, but is also wonderful on other kinds of fish or chicken . Toast the cumin seeds in a small pan over medium-high heat for about 2 minutes, or until fragrant and lightly browned. Repeat the same process with the caraway seeds. Pound seeds together coarsely in a mortar. Mash the garlic with the salt to a paste and add to seeds. Place the jalapeños, cilantro, and parsley in a food processor and purée until finely minced. Add the seeds and garlic mixture, and with the machine running, slowly pour in the olive oil. Taste for seasoning. Add the 3/4 C. pitted olives to 1/2 C. of the sauce, and reserve the rest of the sauce for another time. Put Pernod in a saucepan over low heat and reduce to 1/4 C. Heat a sauté pan over high heat, add olive oil, and fennel, salt and pepper. Turn heat to medium-low and cook for about 10 minutes, or until the fennel softens, stirring often. Add the milk and simmer another few minutes until fennel is very soft and the milk thickens slightly. Transfer to a blender and purée. Meanwhile, cook potatoes in boiling salted water until tender, about 15 minutes. Drain and pass through a food mill, or ricer, or mash well. Fold the fennel purée into the potatoes, add the reduced Pernod, and season with salt and pepper. This can be made up to 2 days ahead of time, stored in microwave-safe dish, covered and refrigerated. Re-heat in the microwave while cooking fish. 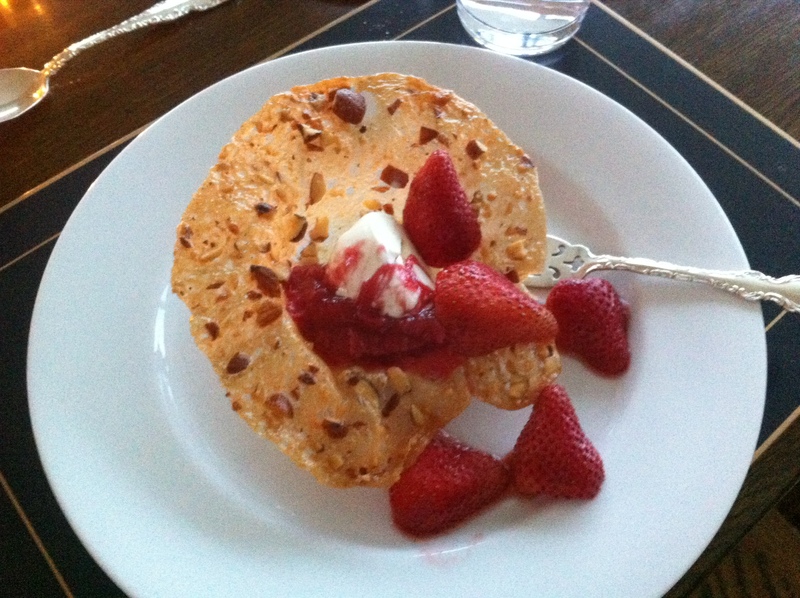 This is one of my favourite spring/summer desserts. You can make use of seasonal fruit when it’s at its best, vary the gelato or ice cream flavour, or use different kinds of nuts. In summer, I substitute the rhubarb compote with raspberry sauce, then finish the dish with fresh raspberries and blueberries. The baskets can be made up to one day ahead, then filled just before serving. Make sure to use parchment paper or Silipat sheets so the cookies are easily removed from the cookie sheet. Cover cookie sheet with parchment paper or Silipat. Combine butter, corn syrup and sugar in a small saucepan over medium heat and stir until blended and warm. Stir in nuts and flour. Put 1 – 1 1/2 T. batter onto cookie sheet (2 per sheet) and bake at 350° until golden. The batter will spread during baking and you will be able to tell after the first batch how large the baskets will be. In the photograph here I have used 1 T. batter and the baskets are about 4″ in diametre. Let set just until you are able to remove the cookies in one piece (about 1 minute) and quickly form them over a rounded dish or bowl. Let cool, then remove each basket to a tray to make room for forming the next batch. To serve, place one cookie on each dessert plate, fill with a scoop of gelato and top with a spoonful of rhubarb compote and fresh strawberries. Combine rhubarb, water, zest and juice in a medium saucepan and cook gently, stirring, until rhubarb is just tender. Stir in honey to taste and vanilla. Remove to a bowl, cool and refrigerate until ready to assemble desserts. Happy New Year from Nourishing Vancouver to you, wherever in the world you are living, cooking and nourishing those around you! Do you have a family recipe to share? I would love this site to be a place where you feel welcome to submit your own recipes. What are you cooking now? Are there family recipes that you go back to time and time again for everyday meals or for family celebrations? Is there a dish that you remember but no longer have the recipe? Please go to the Contact page and send me a question, a recipe and/or a story. If you have a comment you would like to make on an individual post, please go to the box at the bottom of that particular page and leave a reply there.